Whether you embrace it with open arms or toss it in the trash as soon as it arrives, the Ikea catalog is one of the most widely distributed publications on earth. But to help reduce the environmental impact of all that paper, the company is now recycling old copies into cushion stuffing. 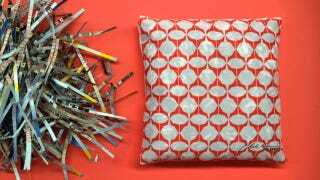 If you happen to live in Belgium, on September 12 you can bring your old copies of the Ikea catalog (if you can part with them) to any Ikea store, where it will be shredded and used as stuffing for a new pillow called KÜSS. The fabric on the new pillow was designed by Charles Kaisin who actually based the pattern on the cellulose molecule that serves as the raw building block of paper pulp. It’s a neat twist on recycling, but also a clever publicity move on Ikea’s part who prints up millions of copies of the catalog every year. Now if only they could find a way to recycle those meatballs into edible food.